Premium Ball Watches for Men & Women | Leslie Gold Watch Co.
Today Ball Watch Company is one of the most respected and established brands in the United States. For more than a century, Ball Watches have been recognized as meeting the highest standards of precision, reliability and quality. Ball Watch Company is the birthplace of the modern watch. It was Webb C. Ball who created the manufacturing process, which produced accurate, high quality and adjustable timepieces. Webb C. Ball of Ball Watch Co. was instrumental in educating the great Swiss Watchmakers on how to make watches like his. Because of their accuracy, Ball Watches were used as the standard for Railroad watches in this country beginning in 1891. The COSC standard that the Swiss government uses to test, grade and certify fine Swiss timepieces that will be labeled “Chronometer,” was created by Webb C. Ball of Ball Watches. Ball Watches are also the industry leader in Tritium tube lighting, and the only company currently licensed by the U.S. government to use up to 100 millicures of tritium gas in the illumination of their watches. The Ball Watch Trainmaster series is a classic watch design that will look as stylish 20 years from now as the day you buy it. This luxury line of watches is for the masculine man who appreciates sleekness, but not at the expense of practicality. Whether you choose the Officer, the Legend, the Streamliner or any of the other models of the Ball Trainmaster series, you’ll be pleased with the sense of accomplishment and sensibility that this watch affords you. Each model consists of the kind of exquisite craftsmanship and precision that you’ve come to expect in the Ball Watch brand. From the finely detailed face to the comfort of the band itself, you’ll experience the same confidence and refinement that closely mirrors your own personal image. With designs like the Ball Conductor watch, a watch with a chronograph that gives more than a nod to the distinguished history of the Ball watch brand itself, the Ball Cannonball watch, with its glow feature to support viewing in dim lighting, you can have your cake and eat it, too. The Ball Trainmaster Streamliner watch doesn't sacrifice functionality for looks. The Ball Trainmaster Power Reserve watch offers you up to 5,000g impact resistance and 50 meter water resistance. That's enough to get you there on time even if you have to dive to arrive. 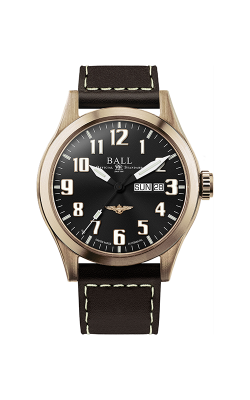 The Ball Trainmaster CannonBall is available with a grey or black dial, to match your suit. Details like these are the reason you'll want more than one Ball watch in your collection of fine watches. We invite you to try a Ball Trainmaster, Ball CannonBall, Ball Conductor, or another fine Ball watch today. The sooner you do, the more time you’ll have with one of the best luxury watches in the world.